For the past two decades, Carrie Moyer’s paintings have boldly merged political imagery, abstraction, and unapologetic visual pleasure. Complex and seductive, her paintings layer overlapping, biomorphic forms, vibrant colors, and a diversity of textures. They are also richly loaded with a range of historical, stylistic, and physical references that include Color Field, Social Realist, and Surrealist paintings, 1960s and ’70s counter-culture graphics, 1970s feminist art, and bodily forms and fluids. Exploring the full capabilities of acrylic paint — what she calls the ugly step-child of oil paint — Moyer often works on the floor, pouring, rolling, stippling, mopping, and hand-working the paint, as well as adding sections of glitter. A painter, designer, and writer, Moyer was born in Detroit, Michigan, in 1960. In 1985, she received her BFA in painting from Pratt Institute in New York, where she continues to live and work. After graduating, Moyer fueled her energy into activism, creating agitprop for groups such as ACT UP, Queer Nation, and DYKE ACTION MACHINE! (DAM! ), which she co-founded with Sue Schaffner in 1991. Through her participation in these activist communities, Moyer began studying the history of graphics and visual propaganda, and earned her MA in Computer Graphic Design from the New York Institute of Technology in 1990. In 1995, she focused again on painting as a student at the Skowhegan School of Painting and Sculpture. Six years later she received her MFA in painting from Bard College. Combining her interest in graphic design and painting, Moyer’s paintings began featuring imagery from 1960s protest graphics, challenging divisions between abstract art and political content. Less explicit in their symbolism, her recent paintings picture mysterious, seductive spaces that assert their own politics of pleasure. 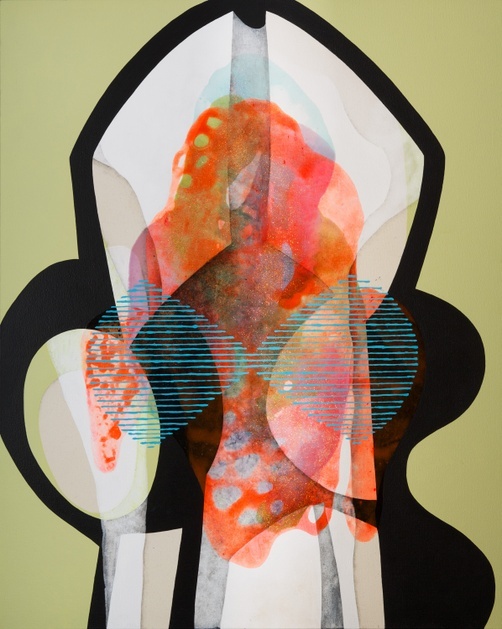 Currently an Associate Professor in the Department of Art at Hunter College, Moyer has exhibited work in solo exhibitions at Worcester Art Museum, CANADA, New York; American University Museum, Washington, DC; and Diverseworks, Houston; among others. Her writing appears in Art in America, Brooklyn Rail, Artforum, and Modern Painters. Opener 24: Carrie Moyer: Pirate Jenny is organized by Dayton Director Ian Berry in collaboration with the artist and is supported by the New York State Council of the Arts and the Overbrook Foundation. The exhibition will be on view at the Columbus College of Art and Design in Columbus, Ohio, from February 6 through May 1, 2014, and the Savannah College of Art and Design in Savannah, Georgia, from June 24 through October 12, 2014. Opener 24: Carrie Moyer — Pirate Jenny is organized by Dayton Director Ian Berry in collaboration with the artist, Carrie Moyer. In her NYC Studio, Carrie Moyer talks about pivotal events in her life that brought her to painting, and the influence history has had in her work.